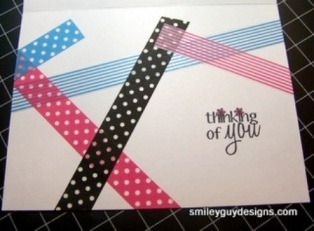 Thinking of You Greeting Cards - Make One Today! Thinking of You greeting cards are really fun to make since they don't really require a specific color theme or graphics. Anything goes! In effect, it takes very little effort to make one and yet it goes a long way to making a friend feel loved. Gather all your supplies and materials for use. 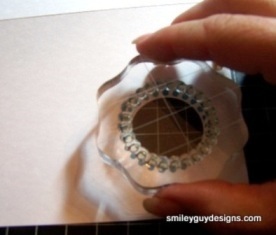 Punch a circle at the bottom right corner of your card base, around half an inch or so from the edges. Center the sentiment through the front of the card and stamp to the inside. Using a pink pen color in the tiny flowers from stamped image. 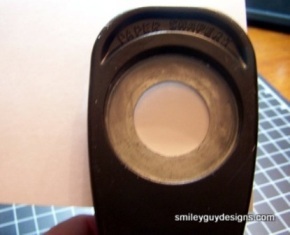 Stamp dotted circle on the front of the card around the punched hole. 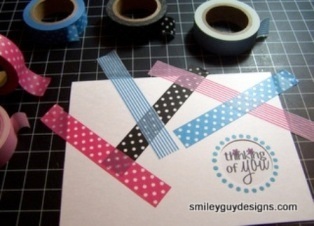 Using various Trendy Tapes, decorate the front of card of the card using different lengths. Hang some off the edge and trim. Decorate the inside using the same Trendy Tapes. 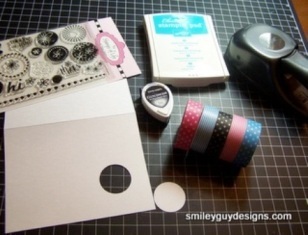 You can add other embellishments if you want like ribbons, flowers and more stamped images or sentiments. And that's it! That's one quick and fun Thinking of You card right? :) You can even finish one in less than 10 minutes! Here's a look at our card again! Thanks for viewing this page! Please don't forget to check out other Thinking of You greeting cards that we have as well as cards of other themes by browing through the navigation bar at the left. :) Hope you had fun!